Battery is the big thing filling the entire floor. It can be charged in multiple ways, at various charging rates. All Tesla vehicles come with a single charger standard. This is a device that takes AC from the charging port and converts it into DC suitable to charge the battery. Classic Model S cars could get a second charger optionally installed/added to have them work together. Two of them can supply power twice as fast. If all energy from them is going into the battery, two chargers will charge about twice as quickly as a single one would. If some power is diverted to other systems (say heating), that difference may be bigger. Each classic Model S chargers handles up to 40 amps, or 80 amps when equipped with two chargers. The refreshed Model S and all Model X and Model 3 vehicles only have a single charger. There were two versions available in some cars. The standard version allows up to 48 amps and an optional version handles up to 72 amps. It appears the 72 amp option has been discontinued. The Model 3 never had a 72 amp option. These chargers only are used for AC power and your choices have no effect on Supercharger charging speeds. This is a universal port that allows you to connect all sorts of things to it. It can accept either AC (depicted using thinner green lines) or DC (depicted using ticker red lines). Line thickness represents how much power they are capable of transferring but this is illustrative only, not created to scale. 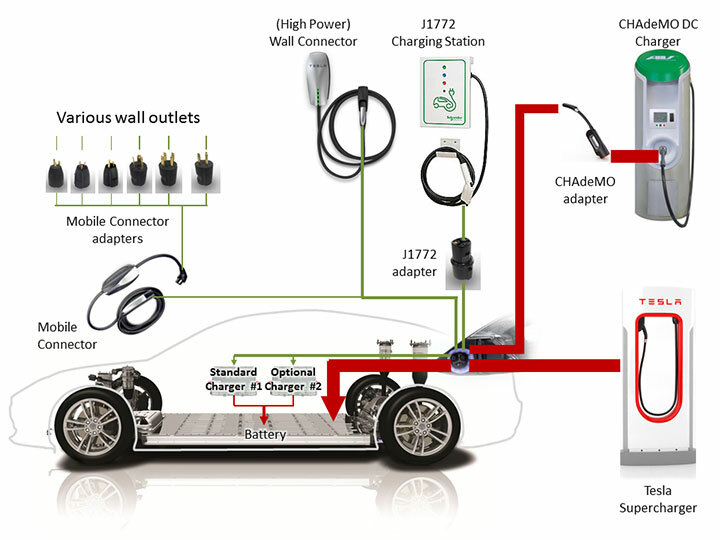 Illustration depicts green (AC) lines going to the charger(s) as it/they have to convert this to DC for the battery. Red (DC) lines almost go directly to the battery (I’ve omitted some complexity from the diagram). Charge port is physically different in different parts of the world. For example, European charge port is built to handle European three-phase power. North American one cannot. They are chargers themselves and the power from them goes directly to the battery. It does not need “help” from the car’s onboard chargers – Superchargers *are* chargers. You cannot buy or install a Tesla Supercharger yourself. These are only installed and owned by Tesla. It is not a matter of pricing, at least not yet. Due to port differences, European superchargers cannot charge North American cars and vice versa. I do not know how many different variants exist but if you stay on the same continent you should not have any issues. [Ed. Superchargers support was an option on discontinued S60 models]. See the SuperCharger Superguide for more. You could think of these as older, non-Tesla version of Superchargers, standardizes for (other) EVs. They use a different connector and “speak a different language” used during negotiation between the car and the charger. For this reason a CHAdeMO adapter is needed to both allow you to connect a different plug and to perform “translation” during the negotiation. This adapter makes the car kind of “think” it is connected to a Tesla Supercharger and lets the DC go directly into the battery. I do not know of CHAdeMO chargers that are as “fast” as Tesla Superchargers [Ed. CHAdeMO power can be up to 62.5 kWh, but is usually far less]. You could buy a CHAdeMO charger but you would find it very expensive. Even if you buy it, you’d need industrial grade electrical service. These things take more power than available with residential service. As CHAdeMO adapters have to plug into charge ports that are different in different regions (Europe, North America), different CHAdeMO adapters are needed for cars from different regions. A CHAdeMO adapter built for North America will not work for European cars even though CHAdeMO chargers themselves are supposed to be equal everywhere. As of July-2018, the CHAdeMO adapter will not work with the Model 3. This used to be called “High Power Wall Connector” or HPWC before, but Tesla now calls it just “Wall Connector”. Acronym isn’t too good, but it is the device that can plug directly into the charging port and supply the car with AC – not DC as Superchargers and CHAdeMO do. Because of this, its power is routed to car’s onboard charger(s) and makes use of them (AC cannot be sent directly to the battery). Given that it is installed properly that it has a sufficiently sized power source, it is capable of delivering as much power as *two* car’s onboard chargers can handle. Wall Connectors do not come with the car in most regions – you can buy them separately. In others it is standard (Australia). Again, the type of the plug of the Wall Connector needs to match the type of the charge port you have on the car (North American, European, …). These are “standard” non-Tesla equivalents of the “Wall Connector”. They look different and have a different connector called “J1772”. Incidentally, the car “speaks” the J1772 “negotiation language” so the adapter needed to allow a different plug to be connected to the charge port is very simple, but is nevertheless needed – a J1772 adapter. J1772 charging stations are standardized everywhere, but the J1772 adapter must match the type of the charge port of your car. One J1772 adapter comes standard with the car. You can buy a replacement or extra ones too. This used to be called “Universal Mobile Connector”, now just “Mobile Connector”. this is like a portable “mini-me” version of the Wall Connector. It does not get “installed” on your wall. The intent is that you take it with you, wherever you go. Instead of being directly wired, it plugs in into regular electrical outlets. Being “mini me”, it is not as powerful as the Wall Connector and it can only deliver as much power as a single car’s onboard charger can handle. There is no need for a more powerful version of the Mobile Connector, though, as no standard wall outlets deliver more power than this one can handle. It, however, has a party trick – the plug “head” is replaceable so that you can put the one that matches the outlet you want to plug it into. These are mobile connector “adapters”. There are many kinds. Some have been produced in the past but no longer, there are new ones. UMCs seem to be different on different continents. A European version handles European three-phase power, for example, and plug into European cars. North American doesn’t do this. One Mobile Connector comes standard with the car with some adapters (plugs) suitable for the region. You can buy other adapters and more mobile connectors as you wish, but they must match your car’s charge port. There are two versions, one that supports up to 40 amps, and a newer version released in 2017 that supports up to 32 amps. Both work in any Tesla S/X/3, but the changeable heads are different and not compatible.